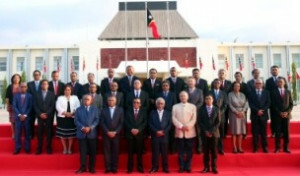 The President of the Republic, Francisco Guterres Lú Olo, swore in 20 members of the SeventhConstitutional Government, led by Prime Minister Marí Alkatiri, at a ceremony held on the 3rdOctober at President Nicolau Lobato Palace in Dili. Those sworn in atthe ceremony were: the Minister of State and Minister for Mineral Resources, Mariano Assanami Sabino; the Deputy Minister of the Prime Minister for the Delimitation of Borders, Hermenegildo Augusto Cabral Pereira; the Deputy Minister of the Prime Minister for Governance Affairs, José Maria dos Reis; the Minister of Education and Culture, Fernando Hanjam; the Minister of Petroleum, Hernani Filomena Coelho da Silva; the Vice Minister for Development of Public Works, Mariano Renato Monteiro da Cruz; the Vice Minister for Development of Housing, Planning and Environment, Abrão Gabriel Santos Oliveira; the Vice Minister for Development of Transport and Communications, Inácio Freitas Moreira; the Vice Minister of State Administration, José Anuno; the Vice Minister of Education and Culture, José António de Jesus das Neves; the Vice Minister of Health, Luís Maria Ribeiro Freitas Lobato; the Vice Minister of Justice, Sebastião Dias Ximenes; the Vice Minister of Commerce and Industry, Jacinto Gusmão; the Vice Minister of Agriculture and Fisheries, Deolindo Silva; the Secretary of State for Gender Equality and Social Inclusion, Laura Menezes Lopes; the Secretary of State of Agriculture and Fisheries, Cipriano Esteves Doutel Ferreira; the Secretary of State of the Council of Ministers and of Social Communication, Matias Freitas Boavida; the Secretary of State for Sport and Promotion of Top-Level Sport, Osório Florindo da Conceição Costa; the Secretary of State for Youth and Labour, Nivio Leite Magalhães; and the Secretary of State for Veterans, André da Costa Belo. These 21 members will join the Prime Minister, Marí Alkatiri and the 11 other Government members who have previously taken office on September 15th, at the Lahane Presidential Palace in Dili. To read the news of the swearing in on September 15th, click here. To read the speech of the Prime Minister, click here.